We’d love your help. Let us know what’s wrong with this preview of City of Skies by Farah Cook. Nora Hunt has just joined the deadly quest to discover the ancient legend of the nine worlds of the Vikings. Her post-apocalyptic dystopian world, Triangle of Peace, is the only home she’s ever known. But at sixteen years old, the skilled young warrior joins an elite band of raiders called Jarls. Her mission? Merely to win the peri ONE GIRL. A DEADLY QUEST. AN EPIC JOURNEY. Nora Hunt has just joined the deadly quest to discover the ancient legend of the nine worlds of the Vikings. Her post-apocalyptic dystopian world, Triangle of Peace, is the only home she’s ever known. But at sixteen years old, the skilled young warrior joins an elite band of raiders called Jarls. Her mission? Merely to win the perilous battle for the artifacts that awakens the Viking realms and avoid falling in love with the charming boy who just happens to be her worst enemy...and she’s not quite sure which task is more difficult… But when Nora learns the Norse gods bestowed her with a mystical secret tattooed on her back the stakes are higher than ever to claim the great Viking Empires. Experience the beginning of this fast paced fantasy saga that will have you turning the pages. If you are a fan of Divergent, The Hunger Games and Cassandra Clare you will enjoy this series. Warning: This book contains action, mystery, romance and general badassery. Read at your own risk. Published February 27th 2017 by Lindhart Publishing Ltd.
To ask other readers questions about City of Skies, please sign up. Can anyone please recommend where i can buy this book in Australia? Because I can't find it on book depository or booktopia. Lee Free at the Kobo ebook shop today (13/12/17). Glad I saw it and will look forward to reading it given the reviews. Is this series called "The Girl With the Viking Tattoo", "The Viking Assassin Series" or "The Shadowislands Saga"? Lucie It is now called "The Viking Assassin Series"
Im not that familiar with Norse mythology (besides the Movie Thor) and Vikings so I thought that aspect was compelling. The raider school was fascinating and I loved all the training quests Nora had to go on. I thought the training was really exciting. I liked how the contrast in beliefs between the east and the west affected Nora. Her mysterious past and abilities intrigued me. The explanation for her abilities was interesting. I enjoyed her relationship with Helena but was kind of sad with how Im not that familiar with Norse mythology (besides the Movie Thor) and Vikings so I thought that aspect was compelling. The raider school was fascinating and I loved all the training quests Nora had to go on. I thought the training was really exciting. I liked how the contrast in beliefs between the east and the west affected Nora. Her mysterious past and abilities intrigued me. The explanation for her abilities was interesting. I enjoyed her relationship with Helena but was kind of sad with how things ended. I would have loved it if Nora was a little more snarky. I feel like it would have fit her well. For example, when her allocator was complaining about her first day I wish she would have said something to defend herself, like: "What do you expect. I need more than a freaking minute to adjust to being ripped from my home and thrown into a completely new environment." I also wanted her to tell her teacher that the only reason he was upset was because she knew all the answers. I dont know how to feel about Frederick. He makes an entertaining rival but not a very good romantic interest. Im not a big fan of arrogant, manipulative or controlling love interests but I dont think I was meant to like Frederick in this book. I probably wasnt meant to trust him but I think the sequel might surprise us. One of the major things that bothered me was how he grabbed Noras shirt and told her to stop asking silly questions. I didnt like how Nora was always thinking about Frederick because it made her seem kind of needy and I imagined her more as the independent type. I wasnt a fan of the romance in general but its not the main focus of the story. I also wasnt impressed when they didnt give her time to say goodbye to her friends and when they wouldnt tell her why they were taking her away but I think the author did that on purpose to make me feel for the character. I saw the Karen thing coming and I was a little disappointed we didnt didnt get any new information from her about Nora abilities but Im sure we'll get more anwsers in the sequel. I had a difficult time following some of the world building and the mountain climbing scene. Despite my issues the story kept me engaged and I enjoyed all the action. For an indie debut series this is a good start and I think the sequel has potentiel to get even better. Not to mention, I love finding enjoyable books from diverse authors. OMG, I love this book so freaking much! It reminds me a bit of the Divergent series because of the different "factions". Can't go into detail, since I don't want to ruin the book for anyone, but trust me when I say there's lots of action, interesting "friendships" etc... This is a book you wanna read!!! At 29% I'm throwing in the towel. It's not terrible, but it's not that good either. Reading this is a chore. I couldn't tell up to the point I stopped if this book better fits as Sci-Fi or Fantasy. There are some hints that make me think probably Fantasy. I do know it's not Epic Fantasy and it's not Urban Fantasy. Dystopian, maybe. Post-Apocalyptic - no. Post-Apocalyptic suggests to me a society that has devolved into a state without advanced technology, at the very least. That is not the case he At 29% I'm throwing in the towel. I couldn't tell up to the point I stopped if this book better fits as Sci-Fi or Fantasy. There are some hints that make me think probably Fantasy. I do know it's not Epic Fantasy and it's not Urban Fantasy. Dystopian, maybe. Post-Apocalyptic - no. Post-Apocalyptic suggests to me a society that has devolved into a state without advanced technology, at the very least. That is not the case here. It also suggests to me a story taking place in an imagined future of our real world. Also not the case here. This seems most likely to be a mash-up of Fantasy and Sci-Fi. It's also not Historical Fiction, or Children's Fairy Tales, Folk Tales, Myths (for starters it isn't a Children's book), as I've seen it being touted elsewhere. I also came across zero Norse mythology, beyond the mention of Loki. Literally just a mention. Doesn't mean there isn't any, but there isn't any up to 29%. It did not remind me of Divergent or The Hunger Games except in the broadest and vaguest of ways, nor does it compare with either of those books, in my opinion. Worldbuilding is sparse, haphazard and relies mostly on telling, not showing. Mostly revealed by exposition by the main character – Nora. The story is written in first person, present tense. Which can be tedious to read, and means what we’re told about the world comes from what the MC knows (except for what she frustratingly withholds from us) and comes to us mostly in the form of info-dumps. I didn’t dislike Nora, but I didn’t really like her either. As both the primary focus character and our narrator she comes off as pretty blah. She's also really judgey, and has a bit of a mean streak. I truly think her character suffers from the first person, present narration. Poor Nora isn’t up to the task of performing both roles well. The way it's written there's really no tension or emotional investment in what is going on, even where there definitely should be some. We're told the "Republic" is "cruel", but never shown that. We're told not submitting to the "recruitment" where young people are assessed and assigned an "allocation" by the government, is a death sentence. But since we're simply told this it doesn't really carry any impact. Even being taken away from her home doesn't seem all that dire, although certainly not being happy about it is understandable. There just never seemed to be any weight to what was going on. The writing is pretty good, in general. I didn’t notice any glaring grammatical issues, or punctuation problems. I *did* notice strange/wrong word usage multiple times. As if the book were written by someone who is very good at English, however is not a native English speaker, and therefore makes an occasional mistake in word usage. "The ferry shakes," which gives the impression it's about to break apart or something. What becomes clear soon after is she's simply meaning the normal tossing about in rough seas, causing the MC to become seasick. "Something cold patches my arm, but I don’t react." I think the word that is wanted here is "pinches". Nora is contradictory, and says contradictory things about what she wants and what she thinks. This makes the story confusing, and her character feel muddled. "I’m leaving the East. I’ve been chosen, but to do what?" "I have no idea why they’re taking me to the West and where I will be allocated. What is my destiny?" "...but living on the edge is the one thing I want." "But I’m not happy. I’m terrified. I have no idea what’s going to happen to me from this point on." She already said she wanted to live on the edge, she should be thrilled. There were several times when we receive some explanation right after something occurs where knowing that information would have helped us make sense of the story. Where I’d read something that raised questions, only to find the information I needed was soon to follow. This made the flow of the story feel choppy, and kept jolting me out of the story. This story is not immersive. I was constantly taken out of the story by this sort of thing. "Rainbow people sit at the long wooden table and benches outside..."
"Gustav stands among the rainbow people in Blossom Heights when I walk by." Who/what are rainbow people? We're never told. At 29% I still don’t have a good handle of what genre this story is. It does seem the basic plot is that of: Special girl taken from her home by an authoritative government in order to be trained in order to become a part of an elite group that do a dangerous job and seek rumored magical objects. Bottom line: Don’t recommend. Some may enjoy this, but the story doesn’t flow, the MC feels wooden, the writing means constantly being taken out of the story to try to make sense of things. The story takes place in a land that has technological advancements a bit beyond our current real world. However it’s the West division that employs most of this technology, Nora’s division – the East has little in the way of technology. There’s a television in a communal area, some people live in broken down buses, and outsiders come in to the area in old cars. Nora doesn’t even have a bed, she sleeps on a mat. There’s no indication they reject technology for some principled reason, so I gather they are simply poor due to their insular and communal society. In fact we’re told they all take a vow of poverty. So they do apparently think of poverty as a virtue. The inhabited land is called “The Triangle of Peace”. It has three “divisions”: East, West, North. The Empire and the Republic, as far as I could make out, are both entities that govern the land of the Triangle. However the Empire is subservient and submissive to the Republic. “Ragarok”, as much as I could make out, was a cataclysmic war that reduced this land to the state it’s in now, with the different divisions and the authoritarian “Republic” in charge. So, there’s an oligarchy, but it’s called the “Republic”. Just so we aren’t confused. Because, that’s confusing. In a republic representatives aren’t elected to empower the people, the people are empowered and elect representatives. Somehow these guys just grabbed power and authority for themselves, in some way that is not explained, and now we have a dictatorship. How they stay in power, and why don’t the people kick them out of power? No idea. "...like the statue of capitalism standing tall in the clear blue waters. The statue is 300 hundred feet tall with a large hand raised toward the sky, the hand holding a glittering pot of gold. It is the magnificent symbol of the West division’s wealth and prosperity ruled by the Sovereign Republic." It appears the author doesn't really understand "capitalism" either, because it's not "wealth and prosperity" and definitely not "ruled by the Sovereign Republic" (aka oligarchy). Why there even is an “Empire” along with this is also confusing and never explained. Prior to this power grab the same land was both, at the same time, an Empire and a Republic. Having both an Empress, and the supreme power in the hands of the people. Which doesn’t make sense. But ok. There are many references to some past Viking society, as well as artifacts. However the current world doesn’t seem to have any real influences from such a society, and nothing much is said about them. I gathered that this “Viking society” was around prior to the huge war about 100 years before this story starts, but I could be wrong. We get throw away mentions of it, but no actual information or explanations. "But Frederick tells us that stones will release if the statue is removed, rolling in our direction like an avalanche. It is clearly a hidden trap." I rolled my eyes at this so hard I hurt myself. "Borrowing" from this iconic scene in such an obvious way is just dumb. "If you are a fan of Divergent, The Hunger Games and Cassandra Clare you will enjoy this series." I liked Divergent ok, Liked the Hunger Games 1 & 2, but didn't like Katniss much, didn't care enough to read the third one. Am definitely not a fan of Cassandra Clare. This blurb is actually telling me, a YA Fantasy reader, that I should probably give this one a skip. So, this is a way to turn off readers who may actually like this story (I'll withhold judgement), and cause those who really did enjoy these other books to either have unrealistic expectations, or (more experienced and likely often burned by this sort of claim) to be very, very skeptical. It also appears to be yet another Romance set in a Fantasy world, and touted as a Fantasy. Can we please get some authors who'll write YA Fantasy that is not Romancey? Pretty please? There are Fantasy readers who are not Romance readers. We exist. "...and avoid falling in love with the charming boy who just happens to be her worst enemy...and she’s not quite sure which task is more difficult… " Just, ugh. Telling me in the blurb "Experience the beginning of this fast paced fantasy saga that will have you turning the pages." Readers know blurbs are written by the publisher. So, hardly a credible, unbiased source of how "fast paced" it is, and one that cannot possibly know that it will have each and every customer "turning the pages." The Editorial Reviews section on Amazon is a list of quotes from consumer reviews. Clue: Consumer reviews are not "editorial reviews". At. All. To be fair, this book may not have any editorial reviews, which is perfectly fine (readers don't care that much about them, most especially Fantasy and Sci-Fi readers - professional reviewers tend to be too snooty to care about those genres much), and the publisher may have felt something in that space was better than leaving it blank. I'd disagree, but fair enough. But touting ratings, and reader quotes from GoodReads and/or Amazon in book promo space (Blurb, or Promo area) just screams amateur, and that's not a good idea. The number of 4 and 5 star ratings/reviews, and how exuberant many are in their praise. For a YA Fantasy book published almost a year ago that I have never heard of and none of my YA Fantasy reader Friends and Following have read. Combined with how few 3 star reviews (and under) there are. For a book of this sort I'd expect more 3 star ratings than there are. It's on the Listopia list of "Best Epic Fantasy". Um. That is really, really weird. Sure, some, or a couple, readers may have loved it so much they stuck it on the list. But really, one of the BEST Epic Fantasies? A book I've never heard of, by an author I've never heard of, when Fantasy and Epic Fantasies are books I am a huge fan of and devour and keep my eye out for, always on the lookout for another good one? See, I'm very, very skeptical. Books don't need to be "the best" to be perfectly fine and enjoyable reads. Most books are not the best. Most especially most books that are by unknown, self-pubbed authors. Most especially in Epic Fantasy, where really, really good books are very rare, and the vast majority are acceptable at best, mediocre, derivative even more common. In fact, really good Epic Fantasy books are so exceedingly rare that those that are thought to be very good by Fantasy readers tend to become pretty well heard of by those in Fantasy reading circles. This book is on two pages of Listopia lists! That is a lot for a book that only has about 250 ratings. Quite a lot. To the point that it makes me suspicious how exactly it came to be on so many lists. They also happen to be among the eight readers who think this book is Epic Fantasy. Um, see, that's really strange. Is it Epic Fantasy, Paranormal or Urban Fantasy? Dystopian/Post Apocalyptic (a sub-genre of Sci-Fi, not Fantasy). Cuz those are different things. Maybe these six-seven obvious uber-fans just don't know what kind of book this really is, or are just sticking a book they love willy-nilly on all sorts of lists, whether it fits or not. Certainly possible. I noticed another reviewer say, "...The book fits into the Nordic mystery genre with its cutting-edge Viking theme. Set in a sci-fi, dystopian world..."
There's a Nordic mystery genre? Who knew! So, is this a Mystery then? Because "Nordic mystery" sounds like it should be a sub-genre of Mystery. But wait, "Set in a sci-fi, dystopian world" means it's Sci-Fi, not Fantasy. Well, wouldn't be the first time a book marketed as Fantasy actually was Sci-Fi, or that a reader classified a book as Sci-Fi that was actually Fantasy. Although if it's dystopian then it's definitely gonna be Sci-Fi, not Fantasy. So perhaps this reader has a better handle of genre than those that think it's "Epic Fantasy". Then again, the "Nordic mystery genre" is confusing. While I can appreciate their fanaticism for what is clearly one of their all time favorite books, I do have to question their judgement, or at least perhaps degree of exposure to many books. What I know: after pursuing reader reviews, reading the blurb, and taking a gander at the many listopia lists some excited people have put this book on, I am completely confused about what kind of story this actually is. That's not good. A good idea of what the book is about and what genre it is in. Telling me I'll like it. Telling me how awesome it is. Telling me how much other people have liked it. Comparisons to very popular books. "For readers of....", "If you enjoyed...", "It's a cross between Book A and Book B..." Etc. IMO the blurb itself should be free of any promotion, marketing, advertising type verbiage. Or at least reasonably so. Great Read. I love anything Vikings anyway, due to my heritage. Great book for teens and older to read. This book brought me on a journey with Nora to become a Elite Raider like her dad and find her true identity. Suspense and action it keeps you wanting to know what happens next. What all magic does she hold? Is Frederick really her enemy or is he really her friend? What Lies ahead for Nora? Will she find her father? Will all her questions be answered? Will she learn how to use all her magic? This book was so good! It reminded me a bit of Divergent but it also has some elements of Hunger Games. Nonetheless, this book is everything I hoped it would be and more! I am so glad I got to read it!! 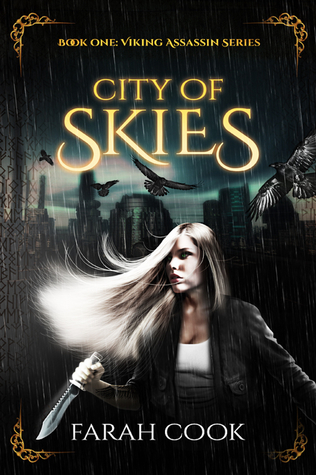 City of Skies follows Nora hunt as she trains to be a Raider and discover the truth about her father and her identity. The author creates a vast and and vivid fantasy world, where much of the land is still a mystery and exploration is a deadly undertaking. That's where the Raiders come in, braving the unknown to uncover Viking secrets from ages past. The characters are interesting and the story is quick paced, keeping you interested until the astonishing climax. A definite read for any fans of H City of Skies follows Nora hunt as she trains to be a Raider and discover the truth about her father and her identity. This is an amazing book - a real page turner. The excitement builds throughout with great, unexpected turns. Nora Hunt is a strong character with such determination. Her skills continue to develop as she becomes an excellent warrior. The book is well written, with vivid descriptions that immerse you into the story. I can’t wait for the second book. This review containers slight spoilers. This is an excellent book with excellent characters and plot development. Farah Cook has taken the Norse mythology and planted it in a future that we can all find ourselves a part of if we look in her books. It did take me a Chapter or two to get used to the view point being used. I'm not used to so much emotions in my main characters (but when you mainly read books like Dresden Files or Star Trek/Wars, it happens). However, once I got used to that I really This review containers slight spoilers. It did take me a Chapter or two to get used to the view point being used. I'm not used to so much emotions in my main characters (but when you mainly read books like Dresden Files or Star Trek/Wars, it happens). However, once I got used to that I really enjoyed the book. If I didn't have to go to work, I wouldn't have put it down until I was through. In this novel, Nora Hunt is a child that is restraining her true nature from revealing itself. She is gifted with extraordinary powers. Real Rating: 4.75 stars out of 5. I'm not going to go into much detail since it hasn't come out yet, but I loved it! You'll love this book if you loved the Hunger Games and Throne of Glass. This book just flies by. I was late to picking it up, but when I did, amazing! The characters are thought out and the plot line is original despite being like the other stories. I hope to see a physical copy and I'll be recommending this to everyone! Can't wait for the next book! I finished this book in one sitting, it was a great story that follows Nora Hunt as she is picked to become a raider, a group selected to locate artifacts. These artifacts are the keys to unlock the nine Norse worlds. In this story we see that trials Nora has to overcome to become a raider or will she not? I encourage you to dive in and find out for yourself. Wow this book was refreshing!! With all the YA fantasy books out there this one was something new. I enjoyed reading about norse mythology a lot and there was never a dull moment. It's filled with action and I can't wait to read City of Vikings and to see what happens with Nora and Frederick. ent from other. Her 'mother' is keeping secrets from her but knows that she cannot ask because of the laws she lives by. One day all the 16 year old teens in her village has to take a test. She's whisked off to another place. She has to make friends, pass unusual test and still try to figure out who she is. Mystery, history, discovery, and myth. This is a book that keeps your attention and wanting more. It's fast paced and there are multiple twists and turns. Like a rollercoaster you can get hooked and either want to cling on tightly to see what happens as well as wanting to race ahead to see what happens. What a great ride! Disclosure: I was offered a free copy of this book by the author in return for an honest review. This is a novel based on Norse Mythology, which is part of why I ultimately decided to give it a try. Most authors focus solely on Egyptian/Greek Mythology when they write stories like this. I was not disappointed in this novel. We follow Nora Hunt as she navigates her trials in the world of the Raiders. She has no idea who or what she is, but over time she finds out. There was so much I loved about this book. The characters were all interesting, and even though it occasionally felt like the plot was obvious, it ended up not being that obvious. Plus, though Nora has abilities that make her slightly more superior, she can't control them. So she really only has a mild edge over everyone else and her perils are still terrifying. Even though this book is Norse Mythology based, as a reader you don't need to be heavily versed in the mythology. Farah does a wonderful job of explaining the mythologies readers need to know. Delighted to have been offered a copy of this book. It was unputdownable. I had a dry spell for the last couple of months, unable to get interested in an books I picked up. However this book had me hooked from page one. I'm not that up on Norse mythology or vikings so found the book intriguing. The setting and world building was perfect. The characters were likeable and interesting. I wanted to know where the book was going, I wasn't able to predict the outcome. After the cliff hanger ending I im Delighted to have been offered a copy of this book. It was unputdownable. I'm not that up on Norse mythology or vikings so found the book intriguing. The setting and world building was perfect. The characters were likeable and interesting. I wanted to know where the book was going, I wasn't able to predict the outcome. After the cliff hanger ending I immediately purchased book 2 and had that read in two hours. Book 3 isn't out yet much to my disappointment. Nora is 16 and is the race to become an Elite Raider from the Jarl Dynasty. There are so many dangers ahead of her, and secrets to discover. She also has to decide who to trust, and even who to love. I really enjoyed this book and the world it is set in. Nora and Frederick work so well together through out the academy. Frederick and Nora are both hiding secrets but them seem willing to trust one another for the time being. However, that may all chance once they graduate and settle into their dif Nora is 16 and is the race to become an Elite Raider from the Jarl Dynasty. There are so many dangers ahead of her, and secrets to discover. She also has to decide who to trust, and even who to love. I really enjoyed this book and the world it is set in. Nora and Frederick work so well together through out the academy. Frederick and Nora are both hiding secrets but them seem willing to trust one another for the time being. However, that may all chance once they graduate and settle into their different Dynasties. I can't wait to read the next book in this series, very much looking forward to it. I love quests and mysteries and other worlds!! Everyone is doing their best to unlock the Shadowlands and when Nora Hunt is forced to leave the East and join the Raider program in the West, she has that ultimate goal too. The program is brutal and only five people end up making it through. Towards the end of this novel, Nora can finally set out to do what she originally was supposed to do....find her father. I really enjoyed this. It was a slightly new take on the Dystopian Genre. Nora is very self-aware which is different and she has a lot of caution, which is not something you see in a female main character often. I think people will really enjoy this book. Hope to find out what happens in the second book. I really enjoyed this book. Nora is a strong smart girl who lives to win. There are quite a few revelations that I wasn't expecting but I won't spoil the story. There was lots of adventure and excitement. I'm not quite Sure how I feel about the maybe love interest though. I can't wait for the second book and anything else this talented author writes. A-MAZ-ING!!!!!! I highly recommend this book if you're fans of fantasy, sci-fi, and dystopia!!! After reading the first few chapters I was hooked and the the excitement builds throughout!! Nora is a badass heroine, can’t wait for the second book in the series! this was a great read. kept me interested throughout hoping to read more from Farah! loved the characters, the plot. A dazzle filed journey into fantasy in this book. Outstanding first in the series of the Shadowislands Saga. A must read. I loved it! I went into this book not having very high expectations, but I was excited, it was a debut author and the book included Norse mythology, which I find fascinating. Not to mention it was branded as an epic fantasy, totally my kind of thing. I was left a little bit disappointed from this book, even with my lower expectations, I didn't enjoy it as much as I thought I would. I honestly think most of my issues stem from the writing. At first I thought it was just because I wasn't used to her style, so I gave it some time. At about 1/4 of the way through I realized that it wasn't the fact that I wasn't used to her particular writing style, it was just that I didn't enjoy it. The descriptions were incredibly straight to the point, almost being too short, blunt and in your face. It felt very choppy, at some points I actually thought there was a glitch in the ebook and I was missing things. It felt disjointed and I felt like I wasn't sure what was going on, certain things weren't explained well and I felt like I was getting bits and pieces, and not in a fun, put the puzzle pieces together yourself kind of way. While some of this was remedied and made clear by the end of the book, not everything was and I'm still left wondering about things. I found quite a bit of the dialogue between characters felt very forced and didn't flow well. I also found the over use of their names, both first and last, to be jarring and unnecessary. Nora as a main character wasn't the worst I've read, I just didn't care about her, or any of the other characters, in the slightest. It may have been the writing style but I just felt as if there was no way to relate or "get close" with her. In the beginning Nora talks a lot about her abilities and "what she's capable of" but we never really know what she's referring to until later on. I know the idea was probably to build it up and make us really curious so when the reveals started happening we would be really excited. The way that it was talked about so bluntly did the opposite for me and instead of making me curious, it made me annoyed. Even when we got to the "reveal" of some of her capabilities, it just wasn't that interesting. Although I didn't find Frederick to be a bad character, I did find him pretty dull, even with all the mystery surrounding him. There's also a pretty heavy dose of forbidden insta-love in the form of mortal enemies in this book, I didn't find the romance to be believable at all. As for the supporting characters, they didn't leave a lasting impression but while I was reading I enjoyed them for what they were, I do wish that the characters as a whole were more fleshed out though. Overall, I think the plot and overall premise is an absolutely wonderful idea but the characters and writing just fell flat for me. Clearly, a lot of people really enjoyed this book if you scroll through the reviews, but I just don't think it was for me and I most likely won't be continuing on with the series. This is a book I would love to give 4 stars to, but I can't because of reasons I'll go into later. No real spoilers, just vague references. The story, characters, and world have so much potential. I was really intrigued from the beginning - it's a pretty unique (in my opinion) take on topics that other popular books touch on. It also successfully combines elements from several genres, which is difficult to do well. The training was cool to read about. Overall the plot, direction of the story, and characters are interesting and intriguing. It's littered with typos, missing or unnecessary punctuation, minor grammar errors, and run on sentences. Words were often used incorrectly or repetitively. The author appears to have forgotten the name of one of the Viking races and it changes from Vandal to another V-name (it escapes me at the moment) at some point. All of this is more than enough to constantly pull me out of the story. The descriptions are choppy and uninteresting. Things happen so quickly that I had to go back and reread things several times to grasp what was going on. The pacing was off. The characters sometimes behaved inconsistently. Sometimes Nora, the main character, would ramble on about how clever and talented and gifted she was, and honestly it just made her a little irritating to me. The writing is also repetitive - I didn't count how many times I had to read about how gifted Nora is, how peculiar Frederick is, or the different Raiding Dynasties, but it was a lot. To sum up, this book has tons of potential but it reads like a first or second draft and it needs a LOT more work with regard to content, world building, writing, and editing. I don't think I'll be reading the sequel when it comes out. This is a fresh and interesting read with links to Norse mythology and history long lost and forgotten. Nora - the main character - has always been out of place, hidden in a district she didn't fit in with, but never knew why. She is selected to train as a Raider - if she doesn't succeed only death or exile are the answer. We start to discover more about her as the book develops with descriptions of times past and powers of the ancients. I would have finished this earlier - but trying to read from This is a fresh and interesting read with links to Norse mythology and history long lost and forgotten. Nora - the main character - has always been out of place, hidden in a district she didn't fit in with, but never knew why. "Farah Cook was born in Denmark, in the land of the Vikings. She grew up in Copenhagen, and had a rich and highly imaginary childhood spending most of her time outdoors. At the age of twelve, she began writing several short stories to Hello Goodreaders. "Farah Cook was born in Denmark, in the land of the Vikings. She grew up in Copenhagen, and had a rich and highly imaginary childhood spending most of her time outdoors. At the age of twelve, she began writing several short stories to fuel her passion for storytelling. Farah graduated with a BA in Political Science from Lund University in Sweden and MA in Arts from London Metropolitan University. She has lived in many countries, including Germany and New Zealand, but settled in London where she worked as a marketing manager for large financial conglomerates. Her passion for storytelling remained, and at night she started to write all the things she’d imagine, and her novel City of Skies is the first book in the Viking Assassin Series. Farah lives in Guildford, just outside London with her husband Christopher, and their two sons Benjamin and Noah. She speaks six languages fluently including Danish, Swedish and German and writes full-time while doing a course in Creative Writing at the University of Surrey."